Preheat oven to 300 degrees F. Grease cookie sheets. In a small/medium bowl, lightly beat the egg white, almond extract, vanilla extract, and vegetable oil until frothy (but not stiff). Sift the flour, cornstarch, sugar and salt together into another bowl. Add water to the flour mix and stir together. Add flour mixture to egg mixture and combine well. Scoop a tablespoon of batter and place on cookie sheet. I did two at a time, maybe three at most. Gently tilt the cookie sheet around to spread the batter out to form about a 4 inch diameter circle. Bake about 14-15 minutes, until outer edge is golden brown. 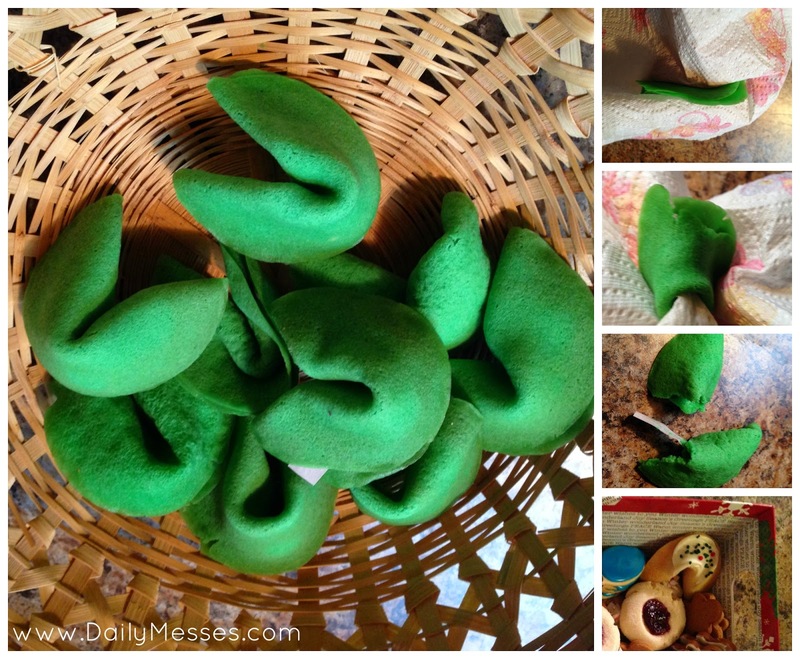 Remove from oven and work quickly to form a fortune cookie! Place cookie in your hand and place fortune in the middle. Fold cookie in half and pull edges over the rim of a glass. I used a paper towel to handle the cookies so I wouldn't get burned. You can place the cookie inside a muffin tin to help keep the shape. For Christmas, I dipped the middle of the cookie in white chocolate and added on Christmas sprinkles.